Vinod condition is not too good. He needs to urgent surgery his pain becomes more and more bearable. We have very less time to collect the total amount required. Hope your extended hands will help his to live a healthy life. Please continue contributing and sharing the post. Thank you so much for the support. We have already crossed the 18 % mark of our goal although our goal is still very far.Vinod is fighting for his life against this disease. 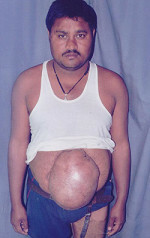 Surgery is much needed to save his life. Please keep sharing within your network. Let's not stop until we reach our goal. Please support vinod .